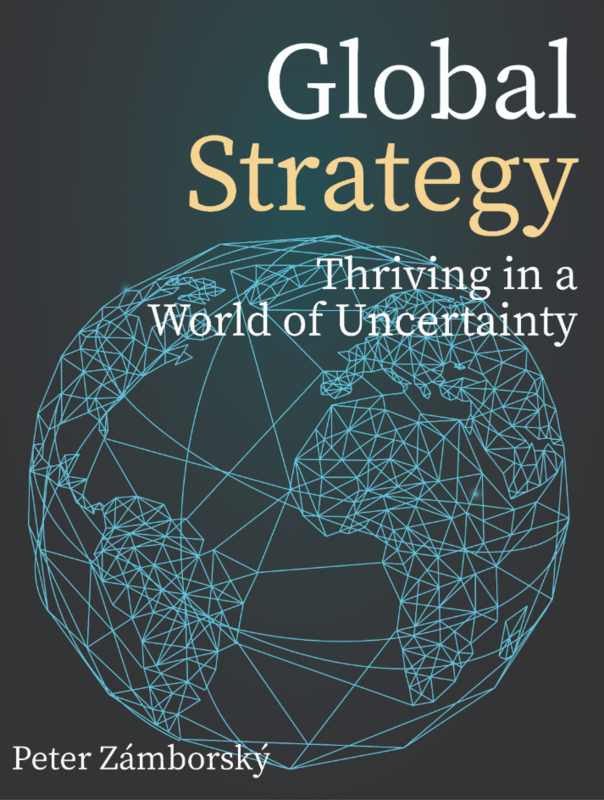 Global Strategy emphasizes the impact of uncertainty on the strategies of firms operating across borders, with a context-sensitive, action-driven, design-led approach. Companies around the world are lured by the promises of Asian and Chinese markets in particular. 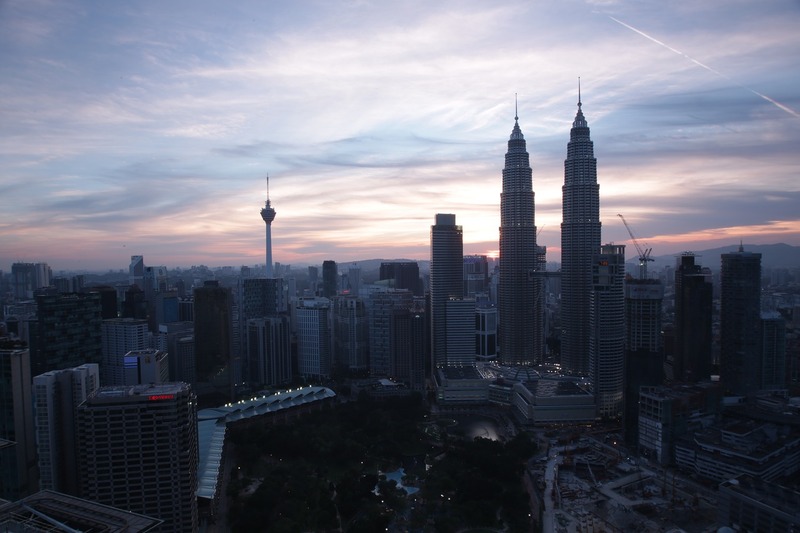 Asia is also the source of an increasing number of world-class multinationals, with about 40% of the 500 largest companies in the world hailing from the region, according to Fortune. However, the future roles of Asia and China in the world and in global strategy are full of uncertainty. The opening case study will demonstrate that success in Asia is far from guaranteed. A global reach across continents can be very difficult to attain even by large multinationals such as Ford. This chapter highlights some of the more cautious perspectives on globalization, focusing on semi-globalization and regionalization. It concludes with a case study on the roles of China and Asia in LVMH's strategy, emphasizing the four types of uncertainty that the French luxury goods firm is facing in China. Ford: Backtracking in Asia. Global competitiveness requires some hard choices. Ford has pulled out of two large Asian markets because of strong local competition. In Japan, imported car brands account for only about 6% of sales and the room for profitable growth in a country with an aging population and young urban customers shunning cars was limited. In Indonesia, Ford was nowhere close to an efficient scale, selling about 6,000 imported cars and trucks per year and not committing to local assembly. The lesson: don't go global recklessly, especially outside of the home region. The following video comments on other factors that affected Ford's decision to backtrack in Asia. The move should be seen in the context of a wider global retreat of the US car industry, with US car-makers closing down their plants in Australia and GM selling its Opel brand to French Groupe PSA. Why did Ford retreat from Asia? Which factors affected Ford's retreat from Asia? ​Semiglobalization is a perspective that suggests that barriers to global integration and connectedness remain high but not high enough to shield countries from each other. In essence, we tend to overstate the extent to which the world is globalized, according to Pankaj Ghemawat, a key proponent of semiglobalization. He gives an example of surveys he conducted with international managers who routinely over-report the degree to which various aspects of business and other activity is “globalized”. In particular, he criticizes Tom Friedman’s book The World is Flat  for lacking data to back it up. Friedman suggested several forces, including technology and the offshoring trend, are creating a globalized world of hypercompetition where the playing field between emerging and developed countries is leveled. The following question asks you to estimate a dimension of globalization, the trade to gross domestic product ratio. This is one of the measures used by Ghemawat to demonstrate his views about the depth of globalization. Try to estimate how much of world trade, FDI flows, portfolio equity stocks, internet traffic and phone calls are international (across national borders) and how much are domestic. Go to Ghemawat’s website and get the recent DHL Global Connectedness Index and try to obtain the most recent estimates for the indicators below. Click on the figure to indicate where these indicators are now (compared to 2013). Both Tom Friedman and Pankaj Ghemawat have had a great deal of impact on the thinking of managers and guiding their companies' expansion around the world. The following two videos provide more substance on Friedman's and Ghemawat's views. Friedman explains what he views as the three eras of globalization, with the most recent era empowering individuals and small businesses from countries around the world to grow on a global scale. Ghemawat stresses that caution is needed in our perceptions about the extent to which we are globalized, in which aspects of international interactions we are seeing continued globalization, and where we see a reversal of globalization. Watch these videos and form your own views: Is the world "flat" or "semiglobalized"? Alan Rugman and Alain Verbeke have also been critical of the globalization hypothesis. They claim that most of the world’s largest corporations are not global but rather confined to the region of their origin: notably Europe, North America or Asia-Pacific. They call these three key regions the Triad. They also argue for using hard data to test the extent to which firms are “global” or “regional” in their operations. They use sales location as a measure of a firm’s globalization, and find that 70-80% of sales from the world’s largest 500 companies (Fortune Global 500) stay within their home triad region. They found that of the world’s largest 500 MNEs, only 9 were “global”, 25 bi-regional and 11 host-region oriented in 2001. They suggest that too much global diversification in sales may have managerial pitfalls (making it more complex, difficult and costly to manage far-flung operations). Their findings were challenged by Tom Osegowitsch and Andre Sammartino, who used different thresholds (10% instead of 20%) and dropped the 50% home region threshold. Using these different metrics, they found that there were 24 global firms and a trend towards more globalization. However, subsequent research found that both sales and assets of MNEs have remained largely regionalized in 2000-2007, with both staying at about 75-80%. Many multinationals penetrate both home-regional and global markets, often simultaneously, and penetration levels often oscillate within an MNE over time. Firms' rates of regional and global expansion are affected by their existing regional and global penetration, as well as their interplay. Overall, MNEs' sales penetration (controlling for the size of the firm's home market and home region) grew both in their home region and globally, and the gap between the two (global penetration lower than regional) remained significant in 1995-05 (for the 877 of 2000 world's largest firms analyzed). Check a recent annual report of one of the only 9 truly “global” firms identified by Alan Rugman and Alain Verbeke. What is the most recent data on its regional/global dispersion of sales, assets or profits? Is the firm getting more “global” over time and what does this say about “global strategy”? Alternatively, update the table above (using one or more firms) to reflect the most recent data. You can also see the mini-case study on LVMH later in this chapter for a figure related to this exercise. ​How is global strategy different from regional strategy? Pankaj Ghemawat outlines what he calls “regional strategies” for global leadership. He says that embracing regional strategies requires flexibility and creativity. A company must decide what constitutes a region, choose the most appropriate strategies, and mesh those strategies with the organization's existing structures. In a world that is neither truly global nor truly local, finding ways of coordinating within and across regions can deliver a powerful competitive advantage. ​LVMH: Growing luxury in Asia. LVMH is a French producer of luxury goods such as Louis Vuitton handbags, Moët champagne and Hennessy cognac. It remained a “global” firm, as defined by Rugman and Verbeke (2004), with over 20% of their revenue coming from each of the world’s largest regions (Europe, North America and Asia-Pacific) in the years between 2007 and 2016. During this period, Europe lost a lot of its share on LVMH’s sales, while other regions’ shares increased. In 2013-2016, Asia-Pacific’s growth stalled somewhat though, partly due to the crackdown on corruption and luxury gift giving in China. How should LVMH respond to these trends and what is the optimal geographic spread of revenues that it should be aiming for? Will Asia be its main future market? A full case study on LVMH and the role of China in its strategy is available in SAGE Business Cases. The following video provides some additional context on reasons for the recent drop in luxury sales in China, highlighting political, economic and other factors. Consider the figure highlighting trends in LVMH's revenue shares by region. Which of these regions should be the priority for growth of LVMH in the next 5-10 years? ​The first building block of the "Thriving in a World of Uncertainty" framework for this book is understanding the four types of uncertainty: (1) clear-enough futures; (2) alternative futures; (3) range of futures; and (4) true uncertainty. We can relate these types of uncertainty to LVMH’s challenge in strategizing around China’s role in the firm’s future. In terms of “clear-enough futures”, the company can be reasonably sure that China (now the second largest economy in the world) will remain an important market for luxury goods including LVMH products. However, LVMH has to chart alternative futures for (1) realistic scenario of a low growth of the Chinese economy and luxury goods; (2) optimistic scenario of a high growth in China; and (3) pessimistic scenario of a contraction of its market in China. For each of these scenarios, a more concrete range of expected market growth and appropriate strategic implications may be specified. For example, the "realistic" low growth could be specified in the range of 4-6% growth of the Chinese economy in the next ten years and 2-4% growth of the luxury goods market in the country in the same period. There is also some degree of “true uncertainty” (possibly related to issues such as regulation, consumers' perceptions of luxury and developments in e-commerce in China) that LVMH can’t accurately predict. Brainstorm about possible risks, uncertainties and other expected and unexpected threats to LVMH in China. 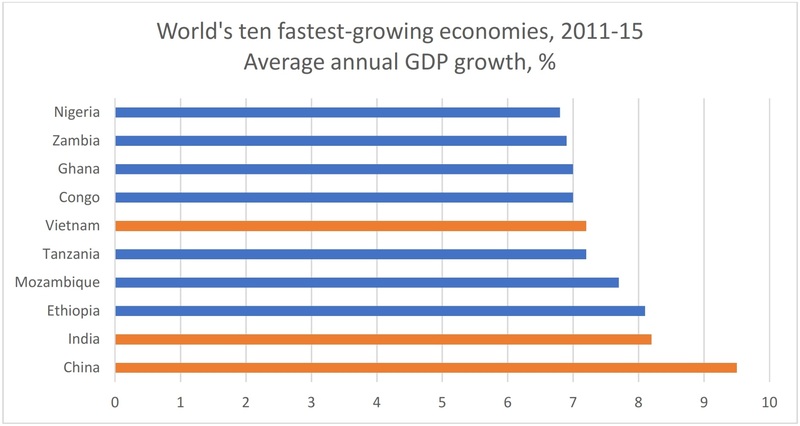 ​Africa is the world's fastest growing region. Africa overtook Asia as the world's fastest growing region in 2011-15, according to The Economist. While growth in some commodity-driven African economies such as Nigeria and South Africa has stalled since then, multinationals are increasingly recognizing the growth opportunity in Africa. For example, the 2017 mega-merger between SABMiller (originating from South Africa) and multinational AB InBev, was partly driven by AB InBev's unfulfilled growth potential in the African beer and beverages market. While most of the largest FDI projects in Africa are still in resource industries (i.e. oil & gas), multinationals increasingly invest in other industries, such as manufacturing (automotive, plastics, pharmaceuticals, consumer electronics) and electricity, according to Financial Times. In spite of Africa's potential and great performance in 2000-2015, there is substantial uncertainty about the growth and business environment of the continent. For example, New Zealand company, Fletcher Building’s Roof Tile Group saw a sharp drop in Africa's shares on its revenues in 2015-17 after the share grew rapidly from 19% in 2009 to from 29% in 2012. One of the key reasons for the drop in revenues after 2015 was Fletcher's over-reliance on oil-exporting Nigeria, where construction was booming while the oil prices were high but demand for roof tiles plunged when the oil prices fell after 2015 and the economy cooled. Presence in fast-growing African countries that are not commodity driven may be a good strategic hedge in Africa. Well over half the sales from the largest 500 companies (Fortune Global 500) stay within their home “ Triad” region (such as North America or Europe), according to research lead by Professor Alan Rugman. Pankaj Ghemawat, a global strategy scholar, is a keen proponent of globalization and his research finds that managers often underestimate the degree to which various aspects of business and other activity is “ globalized” . 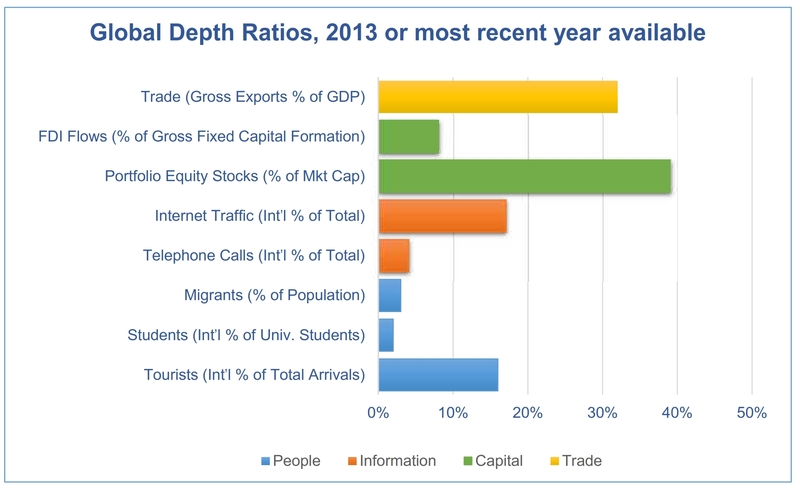 Which of these measures of globalization showed the highest value of "global connectedness" in 2013? What is semiglobalization? How is it related to the concept of regionalization? Do you agree with claims by some researchers that MNEs are increasingly globalized? Why? Rugman and Verbeke (2004) and Osegowitsch and Sammartino(2008) used two different definitions of “global” MNEs. 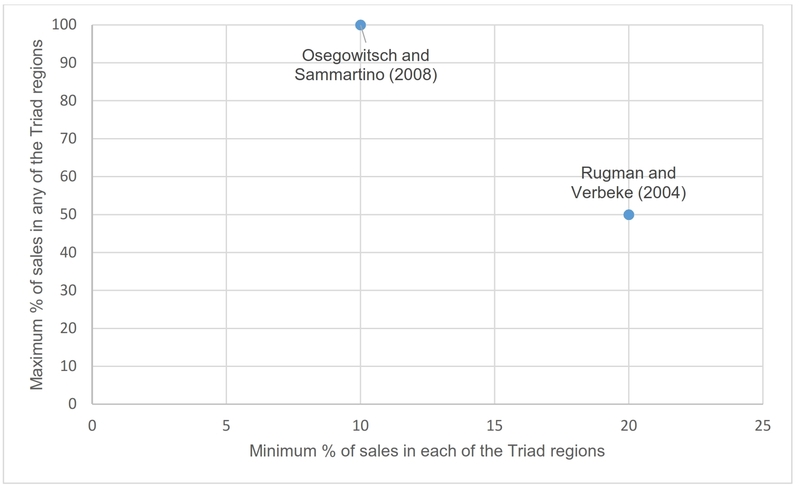 The two key dimensions of the definitions are outlined in the figure below: minimum % of sales in each of the Triad regions and maximum % of sales in any of the Triad regions. Please indicate on the figure below what percentages you would choose for these two dimensions (in order to create your own definition of a global MNE). Click on a specific spot in the figure. What is the justification for choosing specific thresholds? For more case studies linked to this chapter click this link. Below are additional case discussion questions for the SAGE case "LVMH: Is China still a new market?" 1. Is LVMH a global company? Why? Consider different definitions, starting with LVMH’s global spread of revenues. A popular definition of a “global” company (suggested by Alan Rugman and Alain Verbeke) is that for a firm to be “global”, it has to derive at least 20% of revenues from each of the world’s major regions (Europe, North America, and Asia). 2. How would you characterize LVMH’s strategy, especially in a global context? For example, does it stress adaptation to local markets or global integration and economies of scale? 3. How important is China to LVMH? How important will it be to LVMH in the future? 4. Are LVMH’s strategies in China different from its strategies in developed markets, such as USA, France, or Japan? If so, please point out how they are different. 5. Does LVMH need a different strategy in China? What should this strategy be? Propose two concrete alternative strategies for China and discuss their pros and cons. Ghemawat, P., 2003. Semiglobalization and international business strategy. Journal of International Business Studies, 34(2), pp.138-152. Ghemawat, P., 2011. World 3.0: global prosperity and how to achieve It. Harvard Business Review Press, Massachusetts. Friedman, T.L., 2005. The world is flat. London, Allen Lane. Rugman, A.M. and Verbeke, A., 2004. A perspective on regional and global strategies of multinational enterprises. Journal of International Business Studies, 35(1), pp.3-18. Osegowitsch, T. and Sammartino, A., 2008. Reassessing (home-)regionalisation. Journal of International Business Studies, 39(2), pp.184-196. Rugman, A.M. and Oh, C.H., 2013. 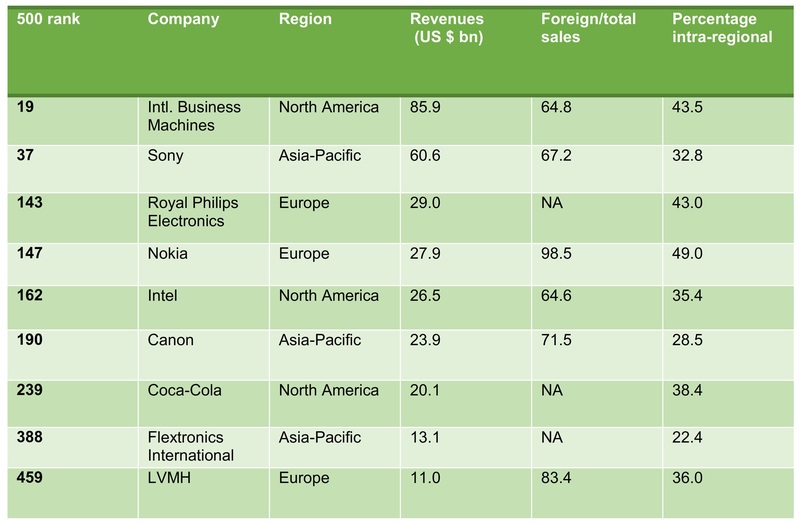 Why the Home Region Matters: Location and Regional Multinationals. British Journal of Management, 24(4), pp.463-479. Asmussen, C.G., Nielsen, B.B., Osegowitsch, T. and Sammartino, A., 2015. The dynamics of regional and global expansion. Multinational Business Review, 23(4), pp.306-327. Ghemawat, P., 2005. Regional strategies for global leadership. Harvard Business Review, December, 83(12), pp.98-108. Liu, Y. and Zámborský, P., 2018. LVMH: Is China still a new market? SAGE Business Cases. SAGE Publications, Thousand Oaks, CA.